After writing a story in primary school about a giant octopus smashing up a boat, Graham realised that making stuff up was easier (also a lot more fun) than reality and decided at an early age that he was either going to be a binman or a writer. 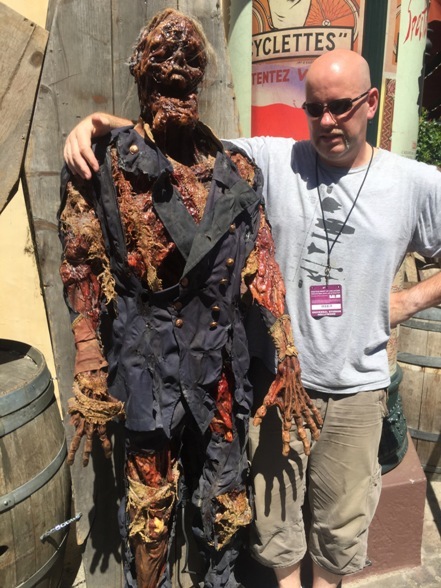 Fortunately, a life on the bins wasn’t on the cards and, after escaping a stint as a building surveyor in Glasgow, he headed south to join Games Workshop’s Games Development Team. Here he worked on projects such as the Tau, Necrons, Witch Hunters, Space Marines and Black Templars Codexes for Warhammer 40,000, Conquest of the New World and The Empire for Warhammer, and The Two Towers for The Lord of the Rings. 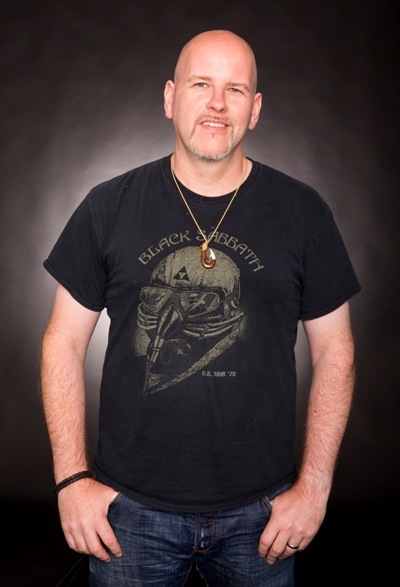 Between populating the various Warhammer universes with fiends and heroes, he’s written over fifty short stories and thirty novels for the Black Library and a number of other publishers. Graham left Games Workshop in the summer of 2006 and spent the next decade working as a full-time freelance author, spending most of his days locked in a tiny office (or tea shoppe), dreaming up new and interesting ways to put his characters through hell on the pages of his stories. Since leaving Games Workshop, he’s ventured far and wide, continuing to cause havoc in the worlds of Warhammer as well as those of Blizzard entertainment’s Starcraft universe and travelling back in time to the 1920s to unleash eldritch horror in a trilogy of books set in the Lovecraftian vein of terror that is Fantasy Flight Games Arkham Horror. His Horus Heresy novel, A Thousand Sons, was a New York Times bestseller, and Empire, the second novel in the Sigmar trilogy, won the 2010 David Gemmell Legend Award for best fantasy novel. Graham left the rain-swept shores of fair Britannia in the summer of 2015 to take gainful employment with a promising band of plucky video game entrepreneurs named Riot Games in Los Angeles, working as a Senior Narrative Writer in the cut and thrust of the Narrative Discipline. Graham is one the most important shapers of the Warhammer Universe. Favorite wargame and army: Warhammer 40,000, Ultramarines. Favorite book: Either David Gemmell’s Waylander or Cliver Barker’s Weaveworld. Favorite role-playing game: Call of Cthulhu. Favorite boardgame: Spartacus: A Game of Blood and Treachery. Juegos y Dados – Welcome Graham, first of all, thank you so much for your collaboration. It is an enormous pleasure to have you here with us. Graham – Thanks for having me, I love talking stories and games with my fellow hobbyists! Juegos y Dados – How did you begin in the world of writing and what was the first story that you wrote? Graham – I think I’ve always been a writer, as I remember writing stories, telling stories and making up narrative games from a very early age. Mostly, I based those games on characters from the comic, 2000AD (I made up a Rogue Trooper board game, A Robo Hunter card game and a Judge Dredd RPG), before venturing into writing a horror novel with a friend when I was at school. We never finished it, but after reading David Gemmell’s Waylander, I set out to write a fantasy novel of my own on a typewriter my dad brought back from his work. I wrote around four hundred pages of it, but never finished it – though I learned a hell of a lot from the experience. At university, I set out to write a 40k novel, which, again, I never finished, but the journey of discovery was great and, again, I learned a lot about the craft of writing. The main character of that novel was a Dark Angel called Uriel Ventris, who later went on to do other things in the Imperium of Man. The first published story I wrote was called Unforgiven, which was about a Dark Angels Interrogator Chaplain going on a mission to hunt one of the Fallen and ending up facing more than he bargained for. Juegos y Dados – How did you start to work in Games Workshop? Graham – Back in 1999, I was working in an architects’ office in Glasgow, hating my job and wanting to leave, but not really knowing what else to do and thinking that the only other thing I was good at was writing about goblins, spaceships and wizards, and who’s going to give me a job doing that?! That lunchtime I picked up White Dwarf, and there was an advert for a Staff Writer at Games Workshop. Working on the principle of, the worst that can happen is they say no, I applied for the job, and – two somewhat surreal interviews later – I was offered the job, and started work in February 2000. Juegos y Dados – How did you get involved in the most famous games of Games Workshop? Graham – My fantasy gaming started with the Choose Your Own Adventure book, The Warlock of Firetop Mountain, which my mother bought me when I was eleven. I devoured it and all the others in that series, then moved on to more freeform RPGs, like D&D, WFRP and so on. I wrote all the adventures we played, and as the scope of those adventures grew ever more ambitious, it became clear I needed a ruleset that could cope with mass battles. I picked up the AD&D Battlesystem rules and we used that for a while, with counters for units etc., then I discovered Warhammer. The first set I got was the 2nd Edition box, the one with John Blanche’s iconic ‘Harry the Hammerer’ cover. From there, the wargaming side kind of took over, though I made sure our battles always had a story to them; how we got here, what the consequences were and what would be next. I was running narrative campaigns without actually realizing that’s what they were. Then Rogue Trader came out, and everything changed. We still played Warhammer, but with 40k, also came Epic and Confrontation (a precursor to Necromunda), which allowed itches of different scales to be scratched. Later on, the pendulum would swing back to RPGs in a big way, but tabletop gaming has always been my main love – so long as there’s a storytelling element to it! Juegos y Dados – What did you enjoy more? Writing articles in White Dwarf or writing codexes? 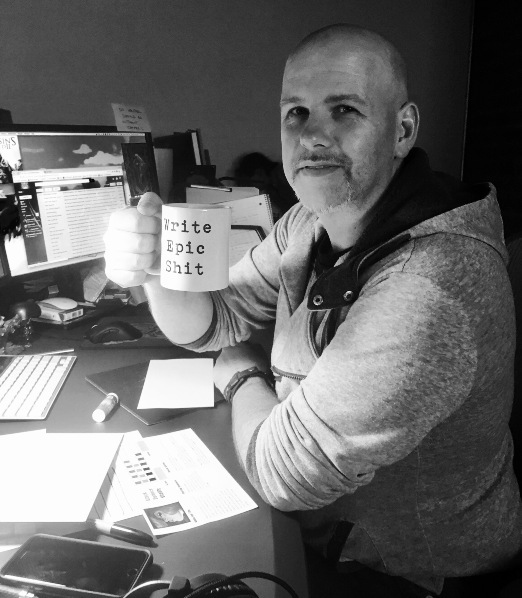 Graham – Most writers I know love variation in their writing, so it’s alas good to switch it up now and again. It’s fun to get into the real meat of a codex and the background of an army, along with its rules and flavour, while at other times it’s useful to stretch your more journalistic muscles on something more conversational, like a painting article or a battle report. I liked both, but I’ve always been drawn to the bigger scale of writing, so – in this example – I’d say codexes were more satisfying to write, because you knew they’d be around for longer and I could tell bigger stories. Juegos y Dados – You were the co-author in some of the best wargames of our times. What do you think about the fact that so many people have copies of the games you’ve written? Graham – I love it. To see people playing armies where I was one of the writers on a project is incredibly fulfilling. I speak to people all the time who tell me that they have X army (usually Iron Warriors) because of something I’ve written. I love seeing games being played with armies I’ve worked on or things turning up in Codexes or army lists that I created in a novel or suggested in a meeting one day. Juegos y Dados – I have heard that Warhammer began like miniatures for roleplaying at late 70s. Could tell us any rumors that you hear in the company? Graham – Well, it’s not exactly a secret that that’s why the Citadel Miniatures were made in the first place, but the thing with only using miniatures in role-playing games is that you don’t need to buy very many of them. The company wanted to sell more miniatures (of course…) so tasked Rick Priestley to write rules for a fantasy wargame that would do that. That game became Warhammer. Juegos y Dados – I suppose that you met some of famous designers there. Could you explain any funny story? Juegos y Dados – What kind of books do you write for Black Library? 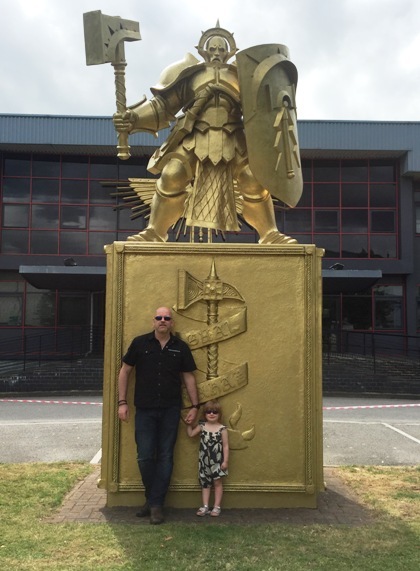 Graham – I wrote pretty much every kind of book for Black Library. I did 40k, Warhammer, Time of Legends, and I also did ‘artefact’ books (like the Imperial Munitorum Manual). I like to think I wrote exciting, action-filled books that kept the reader turning pages with what was happening in the story, but had deeper themes than just bolters blasting/chainswords hacking. Stories like that are great, and we all love a bit of shooty-deth-kill-in-space, but I try to have something more cerebral going on as well, something that’ll make the reader think, even after they’ve turned the last page. Juegos y Dados – What is the novel that you are most proud of? Graham – Man, that’s a tough one, as I’m proud of them all. I’d never have sent them on to Black Library had I not been. I like to set some loose goals of what I want to achieve with every novel I write, and some you hit, some you don’t. And that’s okay, since writing a novel is like wrestling a living, wriggling monster that writhes beneath you as you try and tame it. So some of those goals won’t make the final product, but you’ll have found new ones along the way to include. 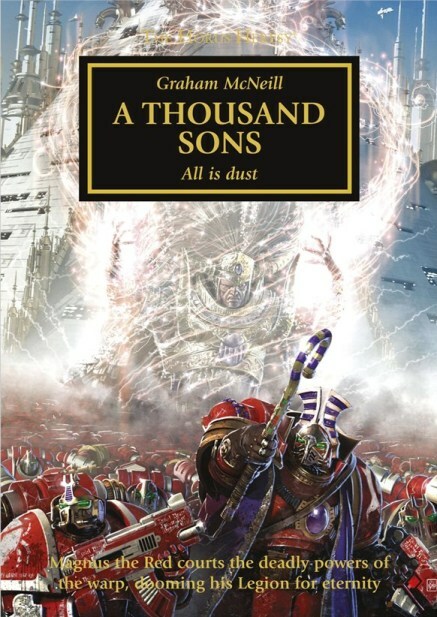 I think A Thousand Sons is the novel where I hit pretty much all the goals I set for myself when I started writing it. But then, I love the Sigmar novels, and the HH ones, and… you get the idea. Juegos y Dados – I love your novels of the Ultramarines. Uriel Ventris is one of my favorite characters in Warhammer 40,000. Will be there more new novels in the future? 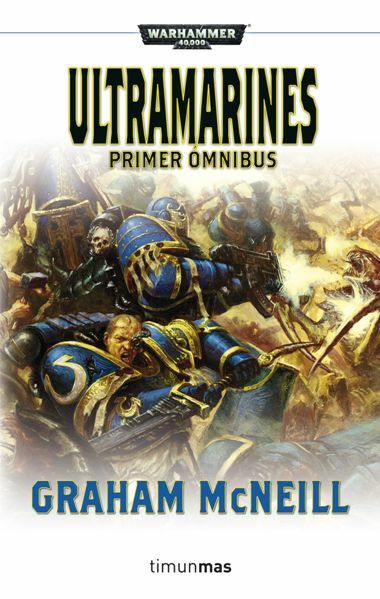 Graham – I’d planned out a new trilogy for Uriel, that involved the Necrons coming back to Macragge for the Nightbringer shard hidden in its deepest vault, and a will he/won’t he wake up scenario for Roboute Guilliman, but then I had a hiatus in writing for Black Library after I moved to the United States, and in that time, the events of the Dark Millennium took place and kind of kyboshed that scenario. I’ve given some thought to how to continue Uriel’s story, and have just penned a short for BL that will see the light of day sometime later this year that I think will surprise a lot of people. Juegos y Dados – I just read Defenders of Ulthuan, I love The Old World. Do you think that the universe of Warhammer Fantasy could have coexisted with that of Age of Sigmar? Graham – Thanks, I absolutely loved writing the High Elf books. I too have a lot of fondness for the Old World, but having been in the belly of the beast, I totally understand – and agree – why the decision to bring the End Times to fruition was taken. I’m only now just dipping my toes in the waters of Age of Sigmar, but I’m liking what I’m seeing so far. And, y’know what…? There’s nothing stopping the two worlds from co-existing. Yes, I have my Stormcast Eternals on the painting table, but I also have my Empire army on the shelf I can bring out for a game of Warhammer whenever I feel like it. Juegos y Dados – Do you know if we can enjoy more Warhammer Fantasy novels when the saga of The End Times finish? Graham – I don’t know what, if any, plans there are for any future novels set in the Old World. I know you can still get the novels set there on the Warhammer Chronicles section of the Black Library website, but I don’t know that it makes much sense to continue telling tales in a world you know has already died. Having said that, perhaps there’s room/demand for more Time of Legends tales, as they’re kind of agnostic of the setting and are still a time of legends even for the Mortal Realms. So who knows? Juegos y Dados – Are you going to write more Warhammer novels in the future? Juegos y Dados – What do you think of the success of Warhammer Total War? Do you think part of the success is the setting? Graham – It pleases me in ways too numerous to mention that Warhammer Total War (both I and II) have been such successes. It significantly raises the profile of Warhammer in the PC gaming community, proves that GW licensing is doing great work, and is a fun game in its own right. I know the lead writer on the game, so I’m confident the lore is in good hands, and I’m 100% certain that the fact the game is set in the Old World has played a large part in its success. You can’t beat good gameplay, engaging storylines, and immersive graphics, but who can deny the thrill of leading your Imperial army against the hordes of Chaos on the computer screen? Juegos y Dados – You are working in Riot Games in Los Angeles, as a Senior Narrative Writer and Narrative Discipline, since 2015. How was the change? Graham – It was a pretty big change, as you might imagine. Me, my wife and our two kids uprooted from a nice life in the UK to travel five thousand miles to a new life in a new country… It was a huge change for all of us but, three years later, it’s worked out pretty well. I went from being a freelancer who made his own hours, picked and chose what projects to work on, to having a day job with meetings and regular hours (albeit in an insanely creative environment!). There’s a lot to like about that, but after being Tarzan out in the wild for nearly ten years, it felt a little like having to become Lord Greystoke, and being forced to wear shoes at dinner and having to remember not to swing on the chandeliers from time to time. Riot is a great place to work, and reminds me a lot of my time at Games Workshop, where I get to work with some of the most insanely talented people in a wealth of disciplines, from art, writing, music and design and a hundred others. Juegos y Dados – Could you speak us about the videogames that Riot Games design? Graham – Riot is primarily known for League of Legends, a 5v5 Moba (multiplayer online battle arena) where teams of five players compete against another team of five players on an intricate map to destroy their base before their own base is destroyed. It’s a fast-paced, highly competitive game that demands a high level of skill to play well. You pick your champion from a roster of around a hundred and forty champions, each with their own unique skills, weapons, and playstyles, then join a team of your friends (or new friends) and get in the game. Each of the champions has their own individual backstory and place in the world, but League isn’t a game that has – or needs – a strong narrative built into its gameplay. Rather, the story of each game is unique and told in each game’s events as performed by the players, much as a great game of rugby develops over the course of its ninety minutes. Juegos y Dados – What is the videogame that you are most proud of? 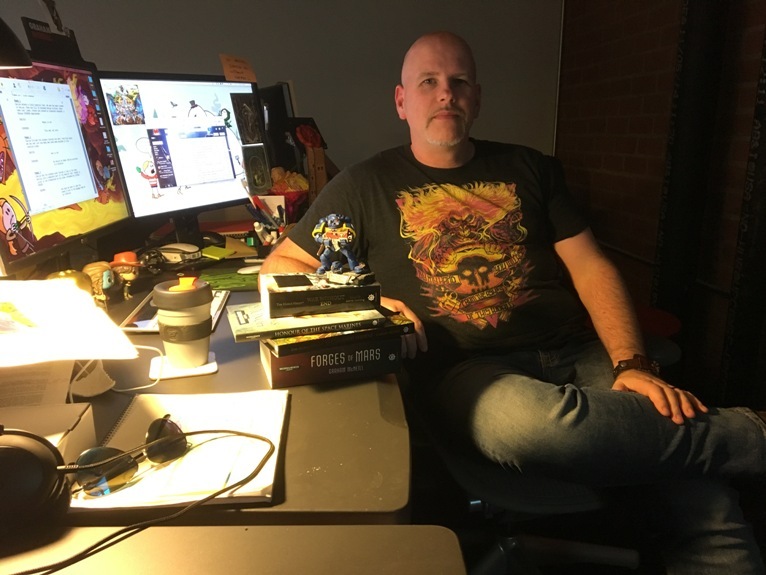 Graham – Beyond writing narratives for Riot, I can’t claim to have done a huge amount of work on video games. I’ve worked on a few mobile games for Games Workshop; I wrote the cinematic VO for the PSP game Squad Commander, and wrote a ton of world building and background for Carnage, a side-scrolling shooter, which was a lot of fun. I was proud of all that work, and always put as much effort into those projects as I would any other. Juegos y Dados – Would you like tell us some near news of Riot Games? Graham – Riot is such a big place and has so many new things coming out (or in the pipeline) that it would be too spoilerific to tell to much of that. We have a ton of cool things on the horizon, and the Frozen Watchers would hunt me down were I to spill their secrets and spoil the surprises in store for our players. Juegos y Dados – What do you think about the wargame industry nowadays? Graham – I think it’s in a golden age right now, with so many new games for all types of players. Whatever you want to play, at whatever level of complexity, there’s a game for you. I play a lot of games with my kids, and we love hopping from tabletop games, to boardgames, to card games and RPGs. I have a games cupboard that’s groaning at the seams with boxes, and that’s only going to get worse (better?) when a lot of my successfully-backed Kickstarters start rolling in. The rise of boardgaming cafes is heartening to see, as is the growing demand for inclusivity and diversity in gaming. There’s still a way to go to make our hobby a safe place for everybody to play or to be able to find something they feel truly represents them, but it’s encouraging to see that demand being is starting to be met by more diverse styles of game and ranges of miniatures. Up with this sort of thing! Juegos y Dados – Is there anything else you would like to tell fans? Graham – I’d like to thank you for having read this far and supporting me by buying and reading my books. For being awesome and wonderful, and being part of a worldwide hobby that encourages people to come together and play. I could not be doing what I’m doing today were it not for my reader and players and fellow geeks around the world, so to you, my tribe, thank you. Let’s get a game in sometime. Juegos y Dados – Thank you so much for your time. We are highly excited for your collaboration in this interview with Juegos y Dados. Graham – My absolute pleasure, t’was great to chat. Thanks for having me on to talk games and stories. Let’s do it again sometime.